Ever been on hold? (Lookin' at you Comcast). Here are the 10 phases we go through - someone save us. The Hopeful Phase: It’s not convenient to be put on hold, but when it first happens you may hold out hope your call will be answered quickly, because you’re a fool. The Sigh Heavily Phase: It’s taking longer than it should so you start the heavy sigh. Every 5 seconds until the people around you get annoyed. While tapping your finger on the nearest hard surface. The Oh Crap, I Have to Pee Phase: At this point you have to pee, bad. You’re left with two choices - try and hold it until someone finally answers or go pee and risk them answering mid-stream. The Jittery I Have to Pee Dance Phase: You decided to wait because, how long can this freaking take? Big mistake. Now your bladder is ready to erupt, so you start dancing around, crossing your legs tighter than a metal vice. The Screw it, I’m Peeing Phase: At some point, enough is enough so you go pee. You put the phone on mute and hope for the best. There is a 75% chance the representative will answer mid stream. The Bargaining Phase: Maybe you should hang up and call back. But you can’t because then you’ll be at the back of the line and wait longer. Maybe you should call back another day. But you can’t because you have meetings! Maybe you don’t actually need help, maybe you can miraculously fix it yourself? Yeah right. You’re screwed. The Acceptance Phase: You start to accept your fate. You slip into a deep depression. The Death by Waiting and/or Rage Phase: The representative finally answers the phone and as they take your name the line is disconnected. You melt like butter into a puddle of rage. You curl up into the fetal position and you may even cry. Yes. You cry. This is my #HoldFace. As you can see, it's very similar to my #ConstipatedFace. So, guess what? I'm joining the #HoldNoMore Campaign. People are rising up to say enough is enough! Power to the people! 53% of Americans say they spend 10 to 20 Minutes on hold every week, which adds up to 13 hours annually? 86% consumers report being put on hold every time they call a business? 48% believe the customer service representatives who answer the phone calls are not helpful? 71% of people are tremendously annoyed when they can’t get a live customer service agent? It’s estimated that bad customer service calls like this costs Americans $108 billion a year? Watch this video to learn more about the #HOLDNOMORE Movement. ATT invented the 800 number, this group wanted to bring this to light in a humorous demonstration/protest. 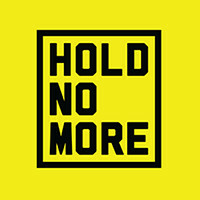 So, who's with me in joining the #HOLDNOMORE campaign? Let me see your #HOLDFACE! Disclaimer: HoldNoMore.org sponsored this blog post. The opinions and text are all mine.